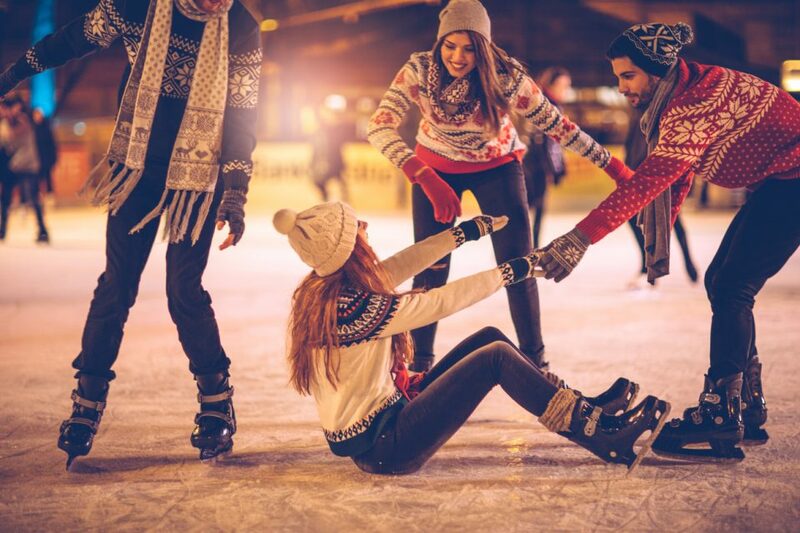 Make the most of this winter and embrace the cold with a trip to the Skating Rink on Farnam, which is at Midtown Crossing. Best of all, you don’t even have to be outside to enjoy this ice rink, as it’s inside the mall. The Rink on Farnam is at Midtown Crossing. Technically, its address is 3409 Farnam St., although you will easily find it if you head to the corner of 34th and Farnam right in the heart of the Midtown Omaha area. The rink will be open until Feb. 25 on Thursdays through Sundays. On Thursdays and Fridays, it opens at 4 p.m. and closes at 10 p.m. Saturdays and Sundays see it opening at 1 p.m. but still staying open until 1 p.m. Admission is just $5 per person, and that fee includes your skate rental, so there are no surprise charges. The synthetic ice rink measures 60 by 80 feet. In addition to the all-weather rink, there is plenty of seating and some fire features. The rink’s synthetic nature makes it unique, as this means it won’t be affected by weather conditions. It’s also completely lubricated and doesn’t need any topical speed, delivering unmatched performance and speed while skating. If you prefer, you can bring your own skates instead of renting, but there is no discount for doing so. The staff just asks that you don’t use figure skates. If you plan to visit the ice rink, just keep a few important rules in mind. In addition to basic common precautions, such as not using foul language, not being rough, not shoving, not going on the rink without skates, and not using alcohol or tobacco, there are specific rules for safety. Skaters 6 and under must wear a helmet (available at the rink), and anyone 15 and under must have an adult with them. The Rink on Farnam at Midtown Crossing is presented by the Salvation Army, and all of the proceeds benefit the organization. It’s currently in search of more volunteers, as well, as volunteer work increases the amount of money that can to the Salvation Army and help others. Each year, this nonprofit serves almost 100,000 people within the Metro area, providing them with material assistance, housing, food, youth development, behavioral health services, and older adult services. In addition, the group helps victims of human trafficking escape. When you are ready to enjoy a few hours of ice skating to celebrate the winter and support a good cause, take your auto from O’Daniel Honda to the Rink on Farnam at Midtown Crossing right here in Omaha, Nebraska.